UPDATE February 19, 2016 We are saddened to learn of the death of Harper Lee today. The New York Times has published an approx. 3000 word obituary. Here’s an announcement from her publisher. Embedded below are two 2015 interviews with Mary McDonagh Murphy, author of Scout, Atticus and Boo and the director of Harper Lee: American Masters, an updated version of her Emmy-winning 2012 documentary Harper Lee: Hey, Boo. 1. Mary McDonagh Murphy Interviewed on CNN’s Reliable Sources (July 12, 2015). A complete transcript of the interview is available here. Mary McDonagh Murphy is the author of Scout, Atticus and Boo and the director of Harper Lee: American Masters, an updated version of her Emmy-winning 2012 documentary Harper Lee: Hey, Boo. 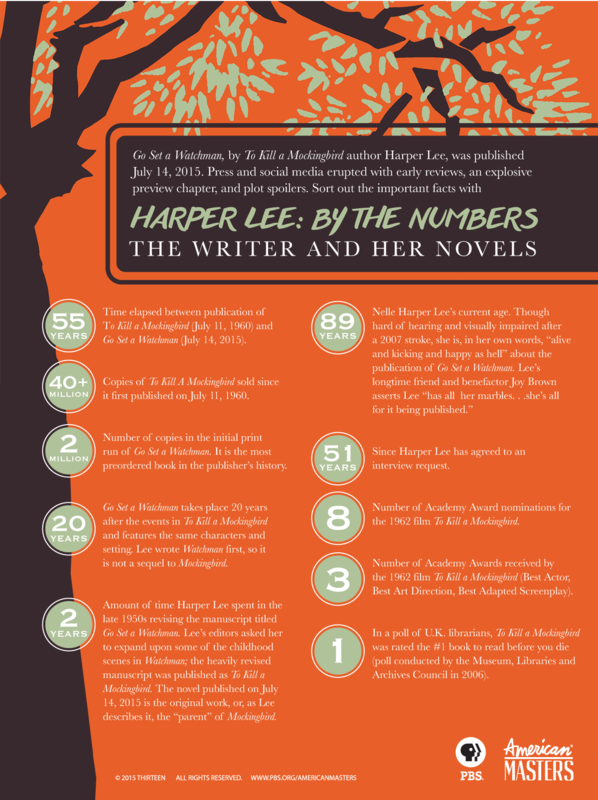 In an interview airing on MetroFocus on July 9, 2015, she speaks about her films and what she knows about the new Harper Lee novel Go Set a Watchman, to be released July 14, 2015, nearly 60 years to the day after the publication of To Kill a Mockingbird. Infographic (embedded below), additional videos, teacher guides, etc.